This Victorian-inspired jewelry craft project from Rings & Things features antique copper and faux black pearls to create an elegant necklace. Sandwich the rivoli between two Victorian filigrees. Both filigrees should be facing the same direction. Secure the rivoli in place by connecting the filigrees together with jump rings, as pictured. Add the 3 crystal briolettes before closing the jump rings at the bottom of the filigrees. Cut two 6" pieces of chain, and connect a jump ring to one end of each chain, and add a lobster clasp to one of the jump rings. Add the Swarovski pearls to eye pins and make simple loops. Follow this tutorial for creating neat loops. Connect the remaining filigrees, pearl components and rivoli pendant as shown. 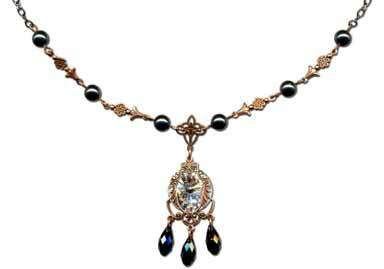 I am amazed at how much this Victorian Garden necklace looks like a pair of rosary beads,so very unique and special. Looks just like something out of the Victorian era. So very classy and a great gift for that family member or friend that loves that Victorian era. Is there a video of this necklace? Would love to see it made. There is many stunning colors that can be used in making this. A little more advanced for a beginner but with practice it can be done.